Entitled a? 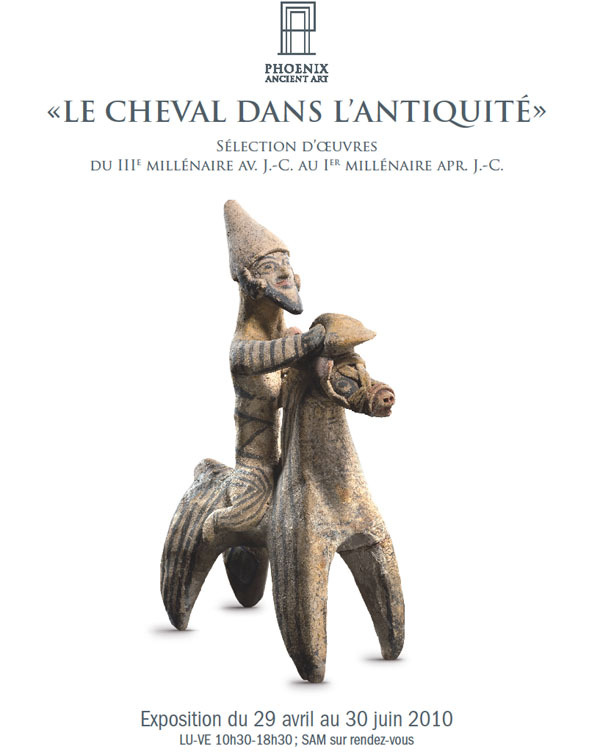 ?Le Cheval dans l'AntiquitA?” the latest exhibition at the Geneva branch of Phoenix Ancient Art is already in full swing. Having already had its opening on April 30, it will run all together for two months, closing on June 30, 2010. Hicham Aboutaam, proprietor of Phoenix Ancient Art, helped to organize this unique celebration of the role of the horse in ancient society in a variety of artworks from antiquity. The exhibition will feature many works from many different times and cultures, all coming together to tell the special story of mana? ?s unique relationship to the horse. Whether they are wild or domesticated, working for us or helping us play, societya? ?s love, fascination, dependence and attachment to the horse has been recorded since ancient times in the art that civilizations have produced throughout the ages. Hicham Aboutaam and his brother Ali invite you to come and participate in this special exhibit which will be happening until June 30 at the Geneva branch of Phoenix Ancient Art, 6 rue Verdaine, Geneva, Switzerland.